Matthew Brown Los Angeles has inaugurated its new space with a refreshing and profound exhibition of work by Kenturah Davis. Blur in the Interest of Precision presents a breakthrough solo exhibition of work by DAVIS, a recent grad of Yale’s MFA program. The work on view includes both drawings and sculpture, created at different periods in Davis’ practice but connected in her ongoing investigation into language – its effect on how we understand ourselves and the world we inhabit. Spanning the gallery walls, Davis’s drawings are captivating from the moment you enter. From a distance, the works are powerful enough, with profound gradients of grey and expert mark making. The effect when you approach the work close up, however, brings a powerful realization that Davis has created her portraits completely out of text. Though she purposely presents most of the words illegibly, distinct letters appear on the surface that together form the entirety of the work. By creating in this way, Davis wishes to complicate ideas of meaning, representation, and perception, drawing attention to the fact the language can just as often complicate things as it does make sense of them. Certain words retain power depending on who speaks them, which takes hold in society. In our modern world, it can be said that language has lost some of its power, as more and more of it infiltrates our day-to-day life. Davis seems to be aware of this fact as she investigates the strangeness of our relationship to language. Though her writing presents ideas the artist herself is working through, Davis adopts some language from writers such as Fred Moten and Toni Morrison, incorporating their own voices into her work. 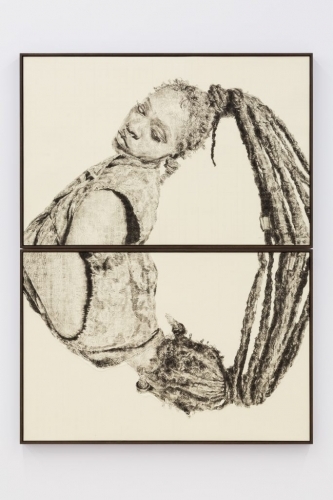 In addition to including self-portraiture, Davis depicts figures that have special place in her life – fellow artists Nina Chanel Abney and Lauren Halsey among other others. She does not give any indication of the person’s identity and often, their appearance is not specific enough to give away the individuals’ persona. Comprised of oil paint, rubber stamp letters, and graphite, the drawings take on an entirely new life when you break down their individual parts. The works retain a raw quality yet exist with complete vibrancy and life. The exhibition title, Blur in the Interest of Precision, justly encapsulates Davis’ practice as a whole. When so much information is presented to us in a straightforward, in-your-face sort of way, sometimes it takes a little blurring to best convey what you are trying to say. Davis’s exhibit marks the first in the newly formed Matthew Brown Los Angeles. With this show setting the bar quite high, we can’t wait to see what the space has in store for the future. Blur in the Interest of Precision is on view at MATTHEW BROWN LOS ANGELES through March 2nd.